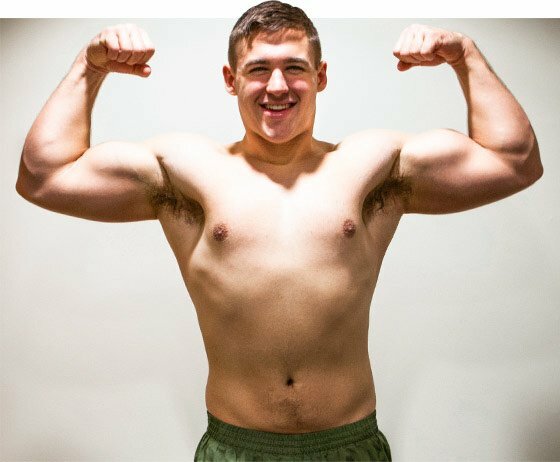 Body Transformation: Clayton Filipowicz Cut Down And Built Marine Muscle! Clayton had to lose 80 pounds to enlist in the Marine Corps and attracted the girl of his dreams. See how this teen titan later added bulk to fill out his powerful physique! My transformation journey began during my senior year of high school when I wanted to get the attention of my long-time crush and couldn't compose myself due to my low self-esteem. My two best friends enlisted in the Marine Corps while pondered over colleges that would devastate my bank account. Then it hit me. I was unhappy with life at age 18, looked in the mirror, and decided it was time to change. I walked into the Marine Corps recruiting office a few days later. As I entered, a slim man who embodied the look of a Marine sergeant told me that I had to lose 80 pounds to enlist and I agreed. For the next eight months, I worked tirelessly to lose weight, gain the girl of my dreams, and enlisted in the United States Marine Corps. A year and a half later, I became a Marine and am dating the girl I nervously chatted up in high school. Most importantly, I have self-confidence. At first, I thought I had to drop weight fast. I basically starved myself, skipped meals, and ate carrots and strawberries. I knew little about weightlifting and even less about proper nutrition. I lifted weights with my friend before school at 5 a.m. and did abdominal workouts in empty classrooms during study hall and lunch. After school, I ran a lot. This pattern went on for months and the intensity increased exponentially. There were many low points. Until I realized that slow progress was still progress, I was miserable. I kept reminding myself that I'd accomplish my goals if I stayed with it. Dieting was the toughest part of my transformation. At first, I went into starvation mode but soon discovered that I could accomplish manageable goals by slowly reducing my calories. Clayton is a broadcaster for the Marine Corps YouTube page and its connected networks! He's also as an editor of the Marine Corps YouTube, Facebook, Flickr, and Instagram accounts! If you want to get big, you have to lift big. I focus primarily on free-weight exercises. I don't use set formulas, percentages, rep ranges, or one-rep maxes. I use a five-day split and then restart from the beginning. I do cardio and abdominal workouts every day. Dieting was the hardest aspect. I was miserable until I realized that I needed to live healthier overall rather than implement a quick-fix diet. Cardio was a close second, though. I'm currently coming off of a great bulk. I went from 175 to 196 pounds. The next few months will be dedicated to a clean cut and a healthy lifting routine. There's no end to sculpting a healthy physique. I'll continue to lift weights and the spirits of those around me. "Remain humble. Everyone is fighting their own battle. Lift up those around you." Success takes time. If you want it bad enough, commit to it, and set realistic goals. Stay positive. Don't listen to people who put you down. Negativity is cancer! Remain humble. Everyone is fighting their own battle. Lift up those around you. Bodybuilding.com helps when I lack motivation to run further or lift heavier. The motivation boards give me an extra push to get off the couch and better myself. Many BodySpace members give helpful tips in the forums. David's bullies became his bros after he get ripped and garnered positive attention. Check out the training, nutrition, and supplement plans he uses to attack the weights!